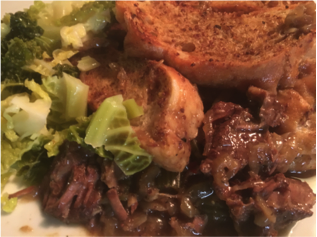 You might think that a beef bourguignon becomes Carbonnade Flamande when you substitute red wine for beer but there's a bit more to it than that. Vinegar, sugar and mustard, combined with the richness of the slightly reduced beer gives a whole new ‘agrodulce’ dimension that’s guaranteed to knock your socks off. Serve as a casserole, as a pie with a pastry crust or, best of all, with a crusty topping of stale, mustard and jus infused bread. Be warned - it's all in the timing. Get it right, and it's not hard, and you're walking through the culinary pearly gates. It’s equally good with venison or other cuts of beef. Adjust the cooking times accordingly. Normally, I’m a great believer in padding our stews with plenty of veg but, here, the flavours are so intense that it’s best to treat it as a celebratory blow out or just serve less. Turnips might work but the only thing I’ve found that really adds to a carbonnade is a few sticks of celery, thickly sliced. Lots of recipes call for mushrooms but, for me, neither taste or texture work. 2Melt half the butter in a frying pan and fry off the onions and garlic over a medium heat until just beginning to colour. Transfer to a heavy casserole. 3Add the rest of the butter to the frying pan, toss the steak in seasoned flour and fry off to brown in the frying pan with remaining butter - you may have to do this in batches. 4When all steak is browned, transfer to the casserole and deglaze the pan with the beer and broth. Allow to reduce slightly and give it a good scrape to loosen all the burnt bits and pour into the casserole. 5Now add the vinegar, sugar 1 tbsp of mustard and the bouquet garni, cover and cook in a medium oven (160degC) for around 2 hours. 6Lay the slices of bread out on a baking tray in the oven for five minutes until they just begin to toast. 7Remove the lid of the casserole for the last half hour. 8Take out of the oven and ladle off any excess liquid so it just covers the meat. Save for gravy or soup. 9Cover with slices of French bread that have been spread sparingly with mustard mixed with a couple of tablespoons of the juice. 10Return to the oven without the lid until the bread crisps. 11Serve with robust greens like savoy cabbage or cavolo nero. Mashed potatoes are also traditional but, for me, a little heavy.